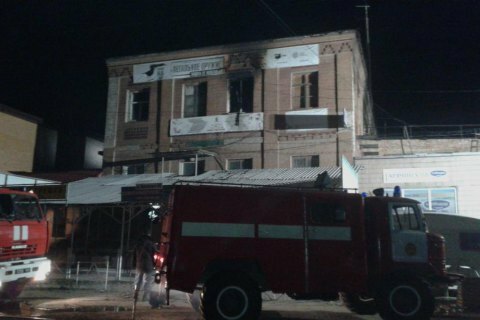 Five people died in a fire which broke out in a Zaporizhzhya hostel and four were hospitalized, the State Emergencies Service said in a statement on Monday, 2 October. "The fire broke out in a 200-sq.m. hostel on the second floor of the building in 36 Zhukovskyy St. on 2 October. The fire was extinguished at 4:15. Four dead bodies were discovered on the site," the statement reads. Firefighters rescued five people, including a child born in 2009. The survivors were taken to hospital, but one of them died upon arrival. Fifteen units of equipment and 52 rescuers were involved in the effort. The cause of the fire is being established. Later in the day, the State Emergencies Service said that the hostel had not been certified for compliance with fire safety norms. What is more, the nearest hydrant has been dismantled. Hostel residents found themselves trapped because of barred windows. On 15 September, three children were killed in a fire in the children's camp Viktoriya outside Odesa.